The musical comedy mystery brings out the best in its two very busy performers. Paul Helm and Kyle Branzel in FST's Murder for Two. 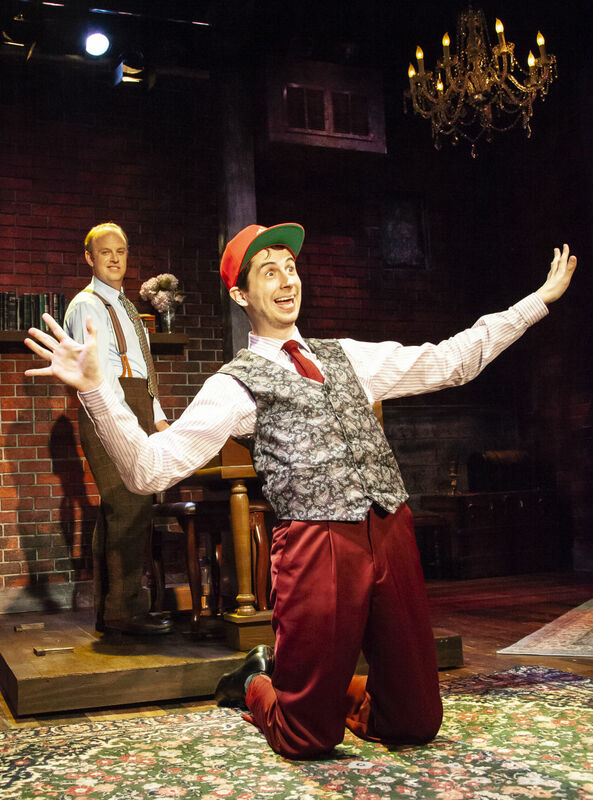 You have to hand it to Paul Helm and Kyle Branzel, the two actors populating the stage of Florida Studio Theatre’s Keating Theatre in the musical comedy murder mystery Murder for Two. They’re working up a sweat this steamy Florida summer as they bring to life not only their characters but also the songs by Kellen Blair and Joe Kinosian—the two play the piano that’s center stage and very nearly another character itself even as they unspool the not very complicated (and pretty silly) story that propels the fast-paced action. That story begins with a gunshot at a surprise birthday party for author Arthur Whitney, where the (unseen) guest of honor receives that unfortunate present. Would-be detective Marcus Moscowicz (Paul Helm), longing to move up from his more humble post as a small-town cop, knows, as he sings, that it’s “Protocol” to wait for the detective assigned to the case. But he can’t pass up the chance to prove himself by solving it before that (also unseen) detective arrives. So he begins questioning the suspects at the party (as he defends his actions to the also unseen Lou, his cop sidekick). The lanky, limber Branzel plays them all, from the not-so-grieving widow Dahlia, complete with oversize red-framed spectacles and a limp, to squabbling couple Murray and Barb to budding criminologist Steph (the victim’s niece) to a perpetually stretching ballerina to a psychiatrist who seems to hold at least one of the keys to the crime. Oh, and let’s not forget the three young members of a boys’ choir, impersonated by Branzel with differing vocalizations and a switch of a baseball cap. Helm at the piano, while Branzel plays one of his multiple characters. It’s what might be termed a tour de force performance by Branzel, for he soon manages to plant images of each character soundly enough in our minds that we really see them, not just him. 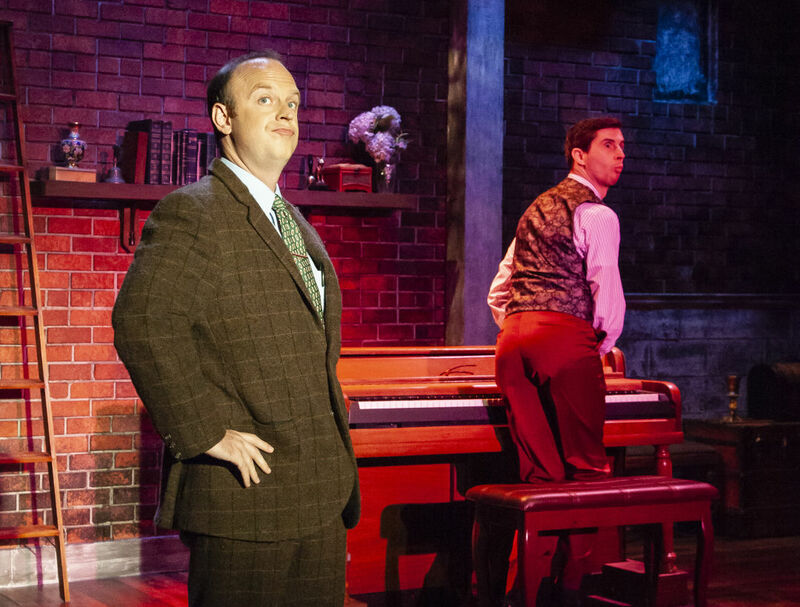 While Branzel’s roles might be showier and offer more range, Helm also displays a knack for establishing a comedic character, while the pair dazzles with their dexterity on the keyboards. The two, under the tightly paced direction of Bruce Jordan, make all the nonsense entertaining, even if the songs themselves are ultimately forgettable and the comedy is emphasized over the crime in the show’s book, co-written by Blair and Kinosian. You won’t exactly be on tenterhooks trying to figure out whodunit, but you will admire the work of the actors as they put it all out there for the course of 100 minutes. Murder for Two continues through July 29; for tickets call 366-9000 or visit floridastudiotheatre.org.